Archaeological Development Services (ADS) Ltd has been the Archaeological Consultant to Bord na Móna (BnM) since 1998 and to date over one hundred and eighty excavations have been carried out in the Counties of Longford, Offaly, and Westmeath as part of BnM’s Mitigation Project. The sites excavated have varied from substantial plank trackways to smaller more enigmatic brushwood platform sites, and have ranged in date from the Neolithic to the Late Medieval Periods. ADS Ltd has also carried out several peatland surveys during this time for both BnM and the Department of the Environment, Heritage and Local Government (DOE H & LG) in the BnM bogs of Kildare, Laois, Longford, Mayo, Meath, Offaly and Tipperary. Archaeological monitoring and testing work as well as EIS reports have also been done on behalf of BnM, Roadstone and the ESBI in several industrial bogs around the Irish midlands. In 2002 ADS produced a document collating and evaluating all existing archaeological data from BnM Bogs from these and earlier projects on behalf of DOE H & LG. During the 1999/2000 field seasons 41 sites were excavated in Castletown, Corhill, Derrynagun, Killaghintober and Tumbeagh Bogs in the Lemanaghan area of the Boora complex. The site types varied considerably from distinctive single plank trackways to brushwood tracks and smaller platform structures. The large plank trackways that are Bronze Age and Early Christian in date indicate a desire or need then to traverse the bog. Like many of the modern roads they are located in the narrowest crossing points, thus providing the quickest route between areas of dryland. The trackways are relatively straight and appear to ignore the topography in most cases; more wood was simply added over areas of localised wetness. 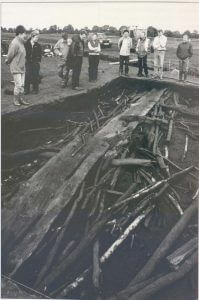 The later time periods were dominated by small brushwood platform structures and short lengths of trackway which indicate exploitation of the wetland resources probably in the form of hunting hides. Lemanaghan has a rich and diverse selection of dryland monuments around the bog margins. These range from enclosures to ringforts and cashels, the Lemanaghan ecclesiastical site, and tower houses, showing a continuity of population presence in the area. Modern dates for some small brushwood sites in Corhill Bog, and historical references to horseback hunting passes, show that bog exploitation and utilisation continued into more recent times. The stray find of a stone axe was the only Neolithic find of the 19 stray finds from the area, while the remainder include a flint scraper, Early Christian and medieval leather shoes, a whetstone, a crozier, 14 silver coins and various wooden artefacts. The stray finds and the Bronze and Iron Age sites from the Lemanaghan Bog complex, combined with the extensive Early Christian and Later Medieval sites, display a constant, however sporadic occupation of the greater Lemanaghan area from prehistoric to modem times. The Mountdillon bogs were re­surveyed by ADS in 1999 and the sites were subsequently excavated between 2001 and 2002. The results of these field seasons are currently in press (Whitaker, forthcoming). Two Neolithic sites were excavated by ADS in Lough Bannow 3 Bog, both of which were relatively narrow structures composed of longitudinally placed rods of brushwood and roundwood and the structures were all located in relatively narrow stretches of bog, providing access to areas of arable dryland on either side. The majority of wood species used in the trackway constructions were readily available in the bog margins. Seven Bronze Age sites were excavated by ADS in Denycolumb 5, Derrycolumb 4, Derrycolumb 3, and Begnagh Bog. The sites of this period are of several form and construction types, from a longitudinally laid roundwood togher, to transversely laid brushwood and roundwood toghers, a large plank trackway, platform structures and an area of archaeological wood. This shows more of a variety of site types, compared with the sites excavated in Lemanaghan. The absence here of visible Bronze Age dryland monuments is in direct contrast with the peatland archaeological record. When the results from both ADS and Professor Barry Raftery’s projects are combined, there have been over fifty sites excavated from this period alone, showing a significant population presence during the Bronze Age in the general Mountdillon area. This population expansion is also apparent in pollen diagrams for the area (Raftery 1996), which show unequivocal evidence for large-scale woodland clearance between 2,000 and 1,000 BC. The only datable recorded stray find from this period is a bronze dagger from Derrynagran townland, while the only excavated artefact (a possible cart fragment) came from the ADS excavation of a large plank trackway in Denycolumb 5 Bog. The Iron Age was the foremost represented period evidenced during the ADS excavations, with the period of 400-200 BC showing the highest concentration of activity. Both Derrycolumb 5 and Derrycolumb 3 bogs have several sites concentrated within this latter period, which was not represented at all in Prof. Raftery’s earlier excavations. These sites, a combination of togher and platform structures in both bogs, show the bygone need for traversing and exploiting the bogs in question and therefore are suggestive of dry land activity in the immediate area ­ perhaps focusing on Ferryman island. During the ADS mitigation project only two toghers dating to the Early Christian period were excavated in the Mountdillon Group, these were in Derrycolumb 3 and Begnagh Bogs. Both toghers were narrow in width and constructed of roundwood and brushwood rods and neither was traced for any great length. The absence of later dated sites may be due, in part to the intensive production of the peatlands in the Mountdillon area, which have been under industrial production since the early 1940s. Medieval and Later Medieval Artefacts have been recorded from the bogs in this area indicating that it is likely that the bogs were traversed or utilised during all the time periods up to modern times. Excavations have been carried out in six bogs in the Derrygreenagh group since 2002. Along with the site types previously known from the earlier excavations, the work in Derrygreenagh has added greatly to the variety of site types contained within Irish Peatlands. An unusual stone enclosure was excavated in Ballybeg bog in 2002, along with previously unrecorded site types that incorporated the use of natural woodland remains in the form of platforms arranged alongside tree stumps. 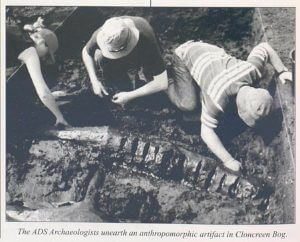 In 2003 during the excavation of twenty five trackways and platforms in Cloncreen Bog four carved alder anthropomorphic artefacts were also found in close proximity. Two of these had been identified, partially exposed on the field surface during the survey work the previous season. All had a carved ‘neck’ and notches along their lengths with tapered ends. Their function remains uncertain but similar finds have been recorded from peatlands in Denmark, Germany and the Netherlands, to all of which has been attributed a ritual purpose. A multi layered Medieval site excavated in Daingean Bog in 2005, which was located close to two Early Christian plank trackways and composed of locally sourced gravel and stones as well as wood, showed adaptation and the utilisation of resources. As well as these new site types, interesting parallels can seen from all areas. As mentioned above, single plank walkways identified in the early Mountdillon excavations have also been excavated in the Blackwater, Lemanaghan and Derrygreenagh bog. 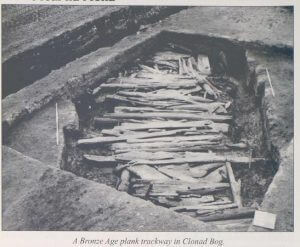 A substantial transversely laid Bronze Age plank trackway, excavated in Clonad bog in 2004, is very similar in construction and date to one excavated by Prof. Raftery and the IAWU in Annacorrib, Co. Galway. The brushwood platforms first identified in the Lemanaghan bogs were also identified in the Derrygreenagh Group. Early wetland excavations, before the BnM mitigation project, concentrated on the investigation of large trackway sites and intensive zones of archaeological activity. While subsequent and intensive fieldwalking surveys of the BnM industrial peatlands have greatly increased the numbers of sites, and have defined archaeological zones around the midlands, this type of survey is only limited to the objectives of identifying, tracing and recording such sites. It is only through excavation that a greater understanding of the nature of these sites may truly be gained. The ADS/BnM excavations have given a greater insight into the date, classification and wider archaeological context of peatland sites. While there are similar sites in all bog areas, the variety of site types appear to vary a little from region to region, perhaps indicating localised response to environmental conditions and use of the peatlands. To date over 180 excavations have been carried out by ADS in twenty BnM bogs in the production groups of Mountdillon, Lemanaghan, Blackwater and Derrygreenagh. These excavations have greatly expanded our knowledge of the extent of peatland use by past societies. It is envisaged that as the mitigation work continues, excavations and post excavation analysis will continue to add to our knowledge and understanding of the wider archaeological landscapes in both the peatlands and their surrounding areas. The top picture here is of an Early Christian plank trackway in Killaghintober Bog. In the second picture is a Bronze Age plank trackway in Derrycoloumb bog.